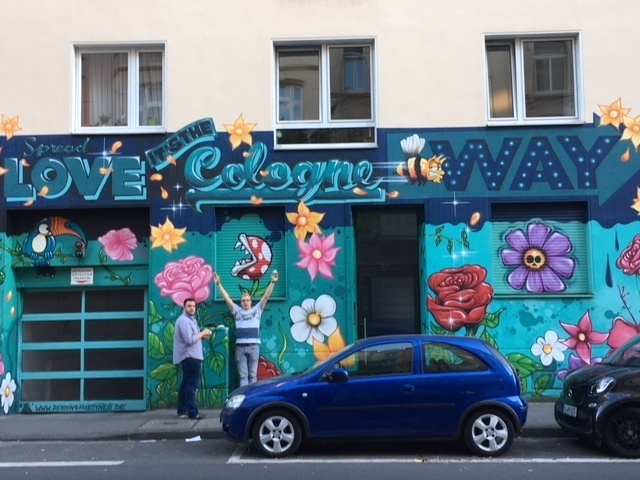 Having just come back from Cologne, Germany, I thought I would share some thoughts about this lovely and manageable city, (the fourth largest in Germany) with you. I’m especially interested in focusing on the food and drink that is specific to Cologne. First, a local beer, made in Cologne, named Kolsch, is the go-to beer. In fact, it is completely legal to walk around the city with an open bottle. Friday and Saturday nights, locals congregate in parks, and simply talk and drink their Kolsch. There is no music, there are no speakers, no entertainment, just people sitting, talking and drinking beer. It’s quite interesting to see! I had the opportunity to enjoy vegan ice cream from a super popular shop, Ice Cream United, owned by a local football (soccer) player. My chosen flavor, lemon-mint was incredibly delicious That was a highlight of my culinary adventures. In traditional Cologne restaurants, you can always get a lovely salad, local mushrooms, salmon, and of course, schnitzel and wursts. And potatoes. Plenty of potatoes. But what is such a pleasure for me to enjoy are the German white wines. Rieslings in particular. Cologne is on the Rhine and that is where the grapes are grown. Here, we usually think “sweet” when it comes to Rieslings, but that is surely not the case in Germany. There is quite a variety to taste and the “trocken” or dry Rieslings are perfect for summer. Light, fruity, crisp and refreshing, I make sure to order a Riesling (or two) with every dinner. I had a conversation with a helpful and friendly bar owner in Cologne, who told me about the interesting food customs and explained the unique (to us) bar scene.